On your ballot, there will be a special election for DeKalb Commissioner, District 1. This is to fill the vacancy, since Elaine Boyer resigned. The five candidates running are: Wendy Butler, Larry Danese, Nancy Jester, Tom Owens and Holmes Pyles. SaveDunwoody reached out to the candidates to learn their views on important questions and has their responses published currently on our home page. 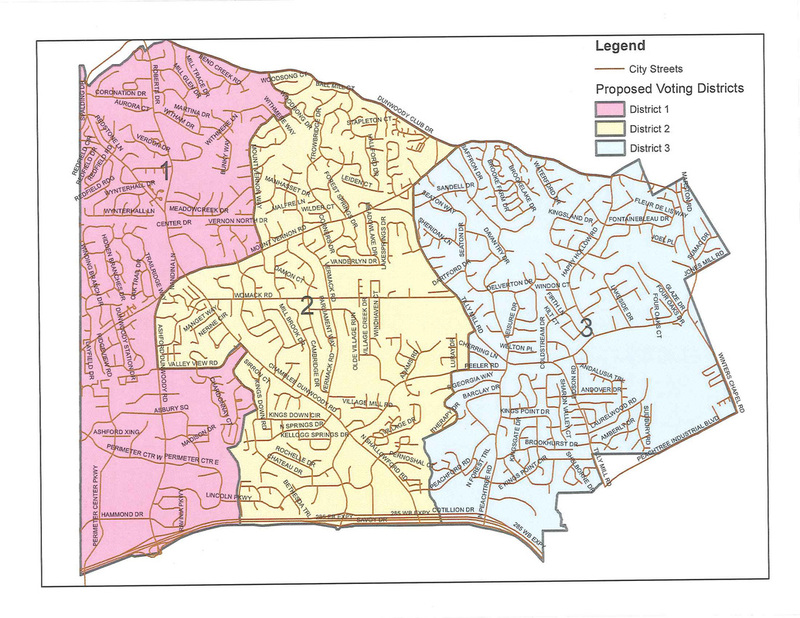 A Dunwoody election will be held on November 5th, 2013 for 3 City Council positions, one for each of the city's 3 districts. Find out what district you live in by looking at the map. There are no "at large" council seats up for election, so you only get to vote for one candidate. We will help provide you with more useful information on this web page as the election draws nearer. Due to the complaints from Dunwoody resident and cycling advocate Joe Seconder, this forum has been cancelled. Given what's been posted lately on some of the well respected Dunwoody blogs it would appear that Dunwoody's very own Red Shirts are well into the third phase and we're still a few weeks from the polls. They could go all the way. The original source of the Red Shirts' discomfiture was the feeling that they were ignored which in their minds fell far short of the promise of small government and local control. Or perhaps they didn't realize that even with local control that real power rests with the self-chosen few. They didn't spend much time in the High School cafeteria did they? Then they started making appearances at Council during the public comment sessions. You know--engage the system. They were snickered at by Council and generally derided on blogs and in the local print media. They did get in some of their own digs but when decorum is shattered by snide comments and giggles from Council it is not a fair fight. But then again incumbency never fights fair. march to citihood. Perhaps great minds do think alike or perhaps it is a form of high-brow humour. Or maybe some folks just never outgrew the High School cafeteria. Dunwoody and now that the City is incorporated this power has been extended beyond mere watchdog to conduit for elected City officials and singular platform for successful candidacy. The Red Shirts neglected to genuflect before them and receive the broad sword's tap on their shoulder. The blogosphere's reaction indicates the Red Shirts are perceived as a legitimate threat to this long established status quo but it is yet to be seen if they will make it to the end of the path described by Gandhi. This time. "I think it's time to sweat the details, not keep asking people to operate 'under the radar' and hope no one complains"